This morning on our way to school, he spotted a green beaded Mardi Gras-style necklace under one of the playground benches. After waving it at a few of the teachers and some moms walking into school, we made our way home. As we walked, he told me his plans for the beads. 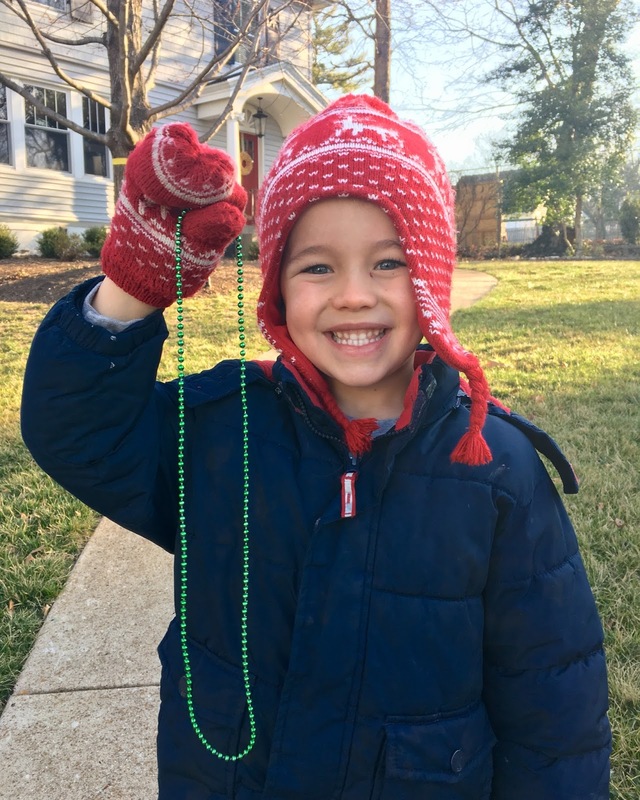 In less than three blocks, he went from saving it from St. Patrick's Day to giving it to Buddy, to going to a friend's new dog, to keeping it, to giving it to a family friend who just lost their dog. There were specific wrapping and presentation plans associated with each recipient. As we approached the house, he said, "I am definitely going to give it to Mrs. Johnson when I see her today. Because she is sad that their dog is in heaven. I'm not even going to wrap it. I will just hide it behind my back, and I will be the wrapped gift. That will make her happy." Oh, Birdie. There are a lot of people that would take you as a wrapped present. Especially if they could use the bow as a muzzle. I say that with love. Charlie is in the habit of waking up bright and early each morning. He wakes up, gets out of bed and stumbles into our room. He stumbles because most times his eyes are still closed. I'm not exaggerating. On some mornings it is so early that I am still in bed. Which is kind of nice, because he crawls in and we cuddle. We cuddle approximately three second before he starts talking. Usually so he can ask me a question, which is typically a thinly veiled demand. Let me tell you, there is nothing I love more than fielding questions at 6 a.m.
"When is it a home day?" "How many more big sleeps until my birthday?" "Can I take my Pokemon cards to school today?" "What are we having for breakfast?" "What are we having for lunch?" "Did you know that in the movie 'Storks,' they say 'Wolfpack, assemble!' and the wolves turn into a submarine, and one guy is the little spy camera that looks at everything above the water? Isn't that so funny, mom?" "Mom, when are you going to buy 'Storks,' for us?" This morning he stumbled into our room around 5:55 a.m. He climbed into our bed, cuddled up to me and then a second later, shot straight up to standing. Looming above me, he waved his arms and declared, "MOM! Today is WARTHOG Day! Do you think the warthog is going to see his shadow? What's the warthog's name again?" I confirmed that yes, it is indeed Groundhog Day, told him the groundhog's name and answered the seven questions that followed. As I did so, I could not help but realize how incredibly ironic it is that for the mornings at least, my life is basically Groundhog Day.